We all hear it every day: The Internet and digital technologies are changing everything. It’s become one of those big pronouncements that tends to end a bad conversation or start a good one. 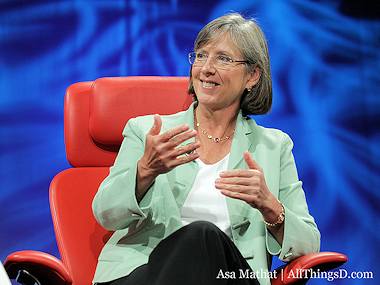 But few people have thought about the subject as clearly and completely as Mary Meeker, the Kleiner Perkins Caufield & Byers venture capitalist and former Wall Street analyst, who in a presentation at D: All Things Digital illustrated those changes in their historical context. We’re pretty familiar with the well-worn tales of how the Internet is disrupting the 305-year-old newspaper business, and how mobile phones are messing up the 125-year-old landline telephone business. But Meeker’s presentation goes a lot deeper than that. The Internet is also disrupting the creation of art, how people document and record the histories of their life, how they take notes, how they borrow money. Roughly a third of Meeker’s 125 slides are devoted to this theme of change and disruption, and when taken as a whole, it’s startling. “A lot of it is stuff you know, but when packaged in a way that you see it all together, I’m overwhelmed,” she said. “People used to put pictures on their walls, and now they have Facebook,” Meeker said. Other examples: Groupon and clipping old coupons. Also, going to school. “Education and learning will become as fun as video games,” Meeker said. Something else that’s changed: How people cope with traffic. During a follow-up interview with Walt Mossberg and Kara Swisher, Meeker talked about Waze, a navigation and traffic app for the iPhone, Android and BlackBerry. She described how, when she saw a burning semi truck pulled over on the side of the road, she reported it first to Waze before calling 911.